IT’S EERILY QUIET at the Tuam grave site on Friday afternoon, the day the world was told a “significant” number of remains of babies and small children were found in sewage chambers on the grounds of former mother and baby home. And it is peaceful today – almost too much so. No one is around. There are no bouquets of memorial flowers. A child’s pink bike lies on its side in a puddle, but there are no children playing in the playground which backs onto the final resting place, as it turns out, of so many hidden innocents. At a glance it looks like a small plot beside just another housing estate in the west of Ireland. In reality it is a scar on Irish society – a mass grave that could hold a substantial number of the up to 800 infants who died at the Bon Secours Mother and Baby home to which it was attached. Walking down the town, the reaction from the locals to the morning’s bulletin from the excavation is mixed. Some are shocked and say they hope the young babies can now rest in peace, others are evasive and hope that this is not a blight on the town they love. “I am born and bred in Tuam and I didn’t know about the stories of the home until about ten years ago,” said one local businesswoman. How they only found out about it now, I don’t know. Why didn’t they do this five years ago or more? Another local said they didn’t want to hear anything about it. Why can’t they just leave it alone, just leave it alone… The people living up there just want to be left in peace, they don’t want to hear about it. 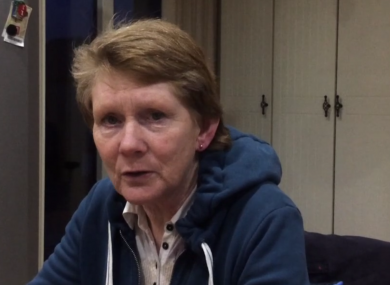 “It will be on the news tonight, but I don’t want to know about it… it is sad – it puts a bad name on Tuam,” said another. There is a sombre mood in the town, as the rain pours down. By stark contrast, Catherine Corless’ house is bustling with journalists and TV crews demanding her time. In 2014, the local historian discovered evidence that human remains had been buried on the grounds of the mother and baby home. Her findings were instrumental in the setting up of the Commission of Investigation into Mother and Baby Homes. On this stormy Friday evening, everyone wants to hear from the woman who has fought hard for the truth for years. A woman who was too often told to just let it go and, at worst, told she was making it all up. Standing in her cosy kitchen near Dunmore, close to Tuam, she and her husband, Aidan, make cups of tea for the strangers who have descended on her home. Survivors from the Tuam Mother and Baby Home, such as PJ Haverty, have also stopped by the Corless household to give their thanks. “If it wasn’t for Catherine, we wouldn’t be here, we wouldn’t finally know the truth. We owe her everything,” he says. As the family dog runs through people’s legs, clearly excited by the heightened atmosphere, Corless takes a seat, while offering a biscuit. I never knew this day was going to come. To get this news so suddenly, and totally unexpected, but fantastic for all the survivors of the Tuam home, and especially for those who have family buried there. She says people were worried the commission wouldn’t take the claims seriously – but, all was made clear when Children’s Minister Katherine Zappone called this morning. “It’s a great relief and I am just very happy with today,” she says. However, the unfurling of the truth doesn’t stop there, says the historian. Those responsible need to be held to account now. The religious order said today in a statement that they had no comment to make in relation to the findings. Corless describes the statement as “most callous”. I want an apology from the Bon Secours – they need to do that – to help the survivors to heal. They need an apology from the State and the religious order, and all the authorities that placed them there, and for their mothers and the way they were treated. The survivors are heart-broken. They know now what mothers went through. They have been treated as second-class citizens all their lives, even to this day. What will happen next? She’s not sure. “It’s up to the survivors really. I think they should be contacted because it is their families that are buried there. The ideal would be to get them [the remains of the children] out of that tank, hopefully, their little bones still remain and hopefully, it is possible to get them out of there and bury them in the main Tuam graveyard, where they should have been buried in the first place. That would be there wish. “At least we know this now, it is a huge step forward, we know they’re there now. Email “No mourning at final resting place of Tuam babies - only an eerie silence”. Feedback on “No mourning at final resting place of Tuam babies - only an eerie silence”.